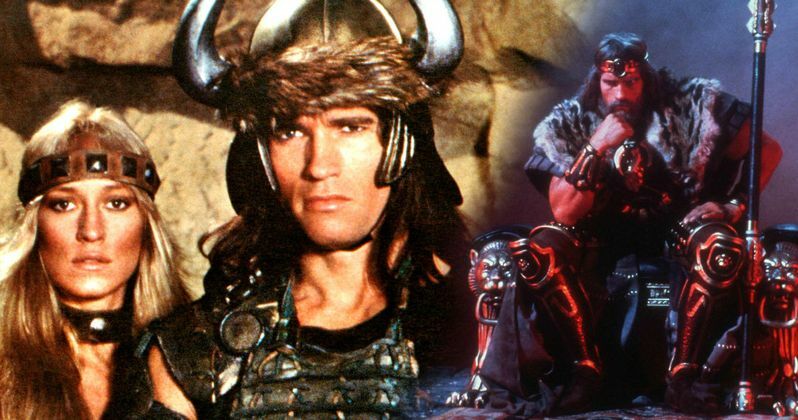 Earlier this year, Universal canceled The Legend of Conan, which would have had Arnold Schwarzenegger reprising his iconic role from the original 1982 classic. Also known in some circles as King Conan, the movie was believed to be dead. Not true, says Schwarzenegger. As far as he's concerned, the movie is still happening. Schwarzenegger was at Cannes this weekend to promote a new underwater documentary. But the talk quickly turned to his impending slate, which includes a recently announced Terminator reboot that James Cameron will be producing and the Twins sequel Triplets. King Conan was almost completely waxed over. But Arnie stopped short for an update, confirming that things are moving forward. "It's being rewritten...the idea is to do it." What we don't have confirmed from the action icon is whether or not the sequel is still at Universal. Arnold has been teasing this movie since 2012, which is actually not that long in Hollywood years. Arnold first played the role in the John Milius directed 1982 adaptation of Robert E. Howard's most famous creation. And in 1984, he returns in the less-violent, somewhat disappointing Conan the Destroyer. Legend of Conan is supposed to return Arnold and the Conan character back to its bloody, R-rated roots. The first attempts at a true third sequel never materialized before Arnold became the Governor of California. This resulted in a one-off reboot from Lionsgate, which starred Aquaman Jason Momoa as a slimmed down version of the Barbarian. Legend of Conan hasn't happened yet due to a lack of trying. Many writers have attempted to tackle the screenplay over the years, including Will Beall, who is credited with co-writing Momoa's Aquaman movie. Longtime Fast and Furious franchise writer Chris Morgan also swung for the fences in penning a new adventure for Arnie and his barbaric after ego. Alas, this never came to fruition. Chris Morgan was the one who delivered a death blow to King Conan a few months back. He had this to say at the time, which is a direct contradiction to what Schwarzenegger said this weekend. Asked if the sequel would ever happen, or if it was still in development, the writer declared this. "Not so much. At the end of the day, the studio decided that they weren't gonna make that. I gotta say, it's honestly a heartbreak. I love that first movie so much, it's one of my favorite movies. We had Will Beall do a draft on [the Legend of Conan script]. He killed it." The writer went onto reveal what the movie would have been about. He offered these exciting details. "Our take was Conan, 30 years later, a story like the Clint Eastwood Unforgiven. It was so awesome. Ultimately, the budget was big, the studio was not really sure of the title, and the relevance in the marketplace. They ended up letting it go. I think they're gonna look to do a TV show or something with it. But just to be associated with it, pitch it to Arnold, have him get so excited, there was a moment of magic for me, personally [laughs]. You never know, down the road we may revisit!" And indeed, that's what it looks like may be happening. King Conan is being resurrected from his development grave, and it sounds like he may rise again after all. While at Cannes, Arnold did say he was possibly hooking up with Netflix for an original project. Could it be a King Conan TV series? That would be amazing. And not out of the realm of possibility. Netflix just this past week announced a 10-episode prequel series for The Dark Crystal, another fantasy epic that also arrived in 1982. So The Legend of Conan Netflix series definitely isn't something to sneer at as an impossibility.